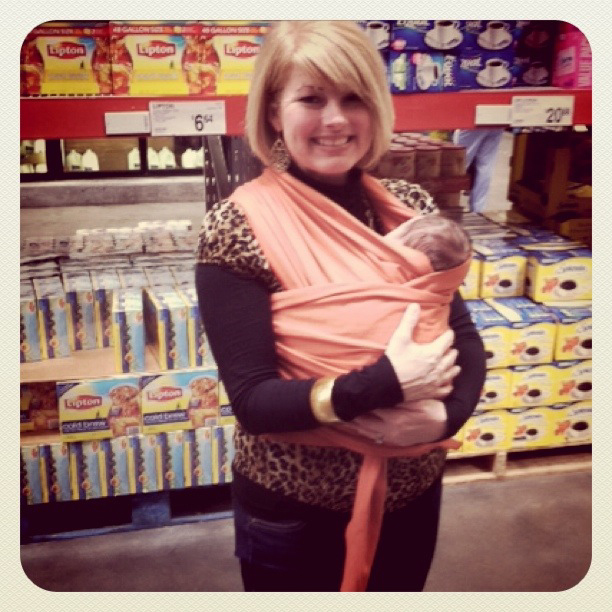 This is another post in the series I'm writing on early motherhood for Huggies and BlogHer. These posts are all about the first few months in a baby's life. It's hard to believe that I'm already out of this stage and into toddlerhood so I love looking back and reflecting. Today I'm asking the question - Did you use a baby carrier and what kind??? And did you like it or did it work for you? I did not use one with Harper for many reasons. Honestly with Harper I thought it was something only granola moms with birkenstocks did. I didn't really know any moms who used those and thought it was kind of weird. Plus she was a big baby and I thought it would be awkward. But in the months that followed Harper and the year or so after, I noticed a trend that everyone was suddenly wearing some kind of carrier. And they seemed to love them. I knew I was having a c-section with Hollis so it became almost a necessity. I couldn't carry around her car seat everywhere and with a brand new two year to chase also - I needed help. Luckily my friend Melissa let me borrow two different ones from her. I liked one over the other and I used it so much those first few weeks. I wore it pretty much every where we went from the time we started getting out around 2-3 weeks until I could finally lift the baby seat. I actually loved wearing Hollis in a carrier. If you get a good kind that is stretchy and tight - it's like a cocoon. Hollis would sleep so good in there and we could go anywhere. And I still had hands to do things or hold Harper's hand. I think it's almost a necessity with baby #2 or #3 or on and on. Scott was never the "baby wearing" kind of guy - but it can be good for dads too if you get a Baby Bjorn or a more masculine baby carrier. So help out the new moms reading - was it worth it to you? Did you use it? Would you suggest borrowing one if possible? Or skip all together?